Here’s the seventh post in our series on local companies that have received the City of Tampa’s Green Business Designation. This week we highlight Birkitt Environmental Services, Inc., which provides environmental consulting services, project management, and permitting and certification assistance for projects throughout Florida. Birkitt has been in business since 1996 and received their designation in 2011. Of course, the core of Birkitt’s business is all about finding the balance between the needs of people and the needs of the environment. They perform wetlands, wildlife and water quality studies, prepare Environmental Assessments (EA) and Environmental Impact Statements (EIS), provide permitting and certification, and monitor a wide range of projects for public and private clients. • Happy customers, who appreciate that Birkitt “walks the talk” on sustainable practices while ensuring that projects are implemented in accordance with environmental regulations. 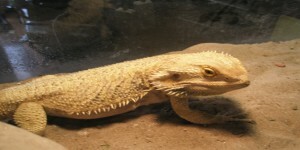 The company’s mascot is Spike, a bearded dragon. For 2013, Birkitt has started a vegetable garden to provide fresh greens for this handsome fellow!